Provides six 1-Wire branches, each with individual impedance matching components. RJ12 jacks for stub 1-Wire branches. RJ45 pass thru jacks for the main 1-Wire trunk. Auxiliary power may be bussed from the main trunk to each branch. Red LED indicates 1-Wire activity. Operating Temperature Range from -67°F to +257°F (-55°C to +125°C). The JB6 junction box is designed to simplify the installation of 1-Wire networks configured in a star / distributed star topology. 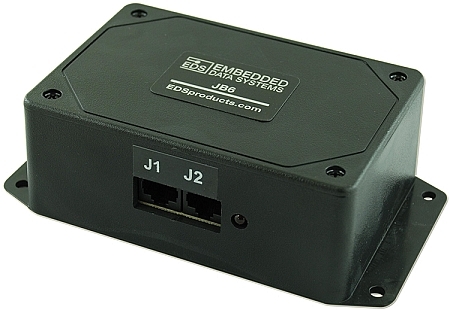 By providing six convenient RJ11 jacks for the connection of sensors / actuators, the JB6 can reduce your on-site installation and maintenance time. Adding or removing a device to the 1-Wire bus is as simple as plugging it in to one of these RJ12 jacks. In addition, the JB6 is designed with two RJ45 jacks that are intended for connection to the main 1-Wire trunk. By providing two jacks, the 1-Wire trunk can be conveniently daisy chained from one JB6 to the next. The JB6 also helps with distributed Impedance matching. When a branch is connected to a 1-Wire bus, an impedance mismatch is created at the point where the branch is connected. Signal reflections from the end of the branch can return to the main trunk and cause problems for other devices on the network. The JB6 contains circuitry that reduces the impedance mismatch at each branch, and also reduces the amplitude of the reflected energy. This helps to significantly reduce the amount of branch generated reflections that reach the main trunk. For a complete discussion of 1-Wire network topologies and issues, please refer to the Maxim Integrated's App Note # 148. A: Thank you for the inquiry. We currently (July 16, 2018) have 58 in stock. An order shipping FedEx Ground would ship today if it is placed by 3:00 pm EST. Expedited orders placed before 4:30 pm EST would also ship today.